Today in Masonic History Alexander Roberts Dunn passes away in 1868. Alexander Roberts Dunn was a Canadian soldier. Dunn was born on September 15th, 1833 in York, Canada, which would later be named Toronto, Ontario, Canada. He attended Upper Canada College until his mother passed away. His father moved the family to England after that where he attended the Harrow School. 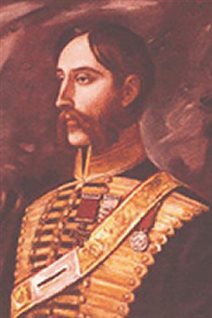 In 1852, Dunn joined the British Army in the 11th Hussars as a junior officer. Two years later the unit was one of the first sent to Russia at the outbreak of the Crimean War. As a lieutenant he participated in the battle of Balaclava and took part in the infamous "Charge of the Light Brigade" It was during this battle that Dunn saved a sergeant by cutting down two or three Russian Lancers. He also, later, saved a private who was being attacked. It was for these actions Dunn received the Victoria Cross, making him the first to Canadian to receive the medal. He was also the only officer from that battle to receive the medal. It is believed that the medals were made from melted down Russian cannons. At the end of the Crimean War, in 1856, Dunn returned to Toronto and began managing the family estate just north of Toronto. In 1857, when the Indian Mutiny began, Dunn organized the 100th Regiment of Foot, a British unit that was entirely recruited in Canada. In 1864, Dunn transfered to the 33rd Regiment of Foot. There he was promoted to the rank of colonel and became the first Canadian to command a British unit. In 1868, Dunn and his unit were sent to the Horn of Africa where they took part in the Expedition to Abyssina (now Ethiopia). Before any military actions could take place, Dunn was killed under unusual circumstances during a hunt on January 25th, 1868. Dunn was buried in Ethiopia and his grave was for some time lost. After World War II, Dunn's grave was discovered. It appeared that an Italian unit that was stationed in the area of the grave maintained it until it was found by a British Officer. Dunn's medals, including his Victoria Cross were on display at his old school, Upper Canada College, until 1977. At the time there was a rash of thefts involving the Victoria Cross medals. The school had a duplicate medal made for display and the original was put in safe keeping. Dunn was a member of Ionic Lodge No. 25 in Toronto, Ontario, Canada.